History: Hoary alyssum is an annual, or short lived perennial that originated from Europe and Asia. It is believed that it reached North America in contaminated alfalfa and clover seed. In Montana, hoary alyssum was first found in Gallatin county in 1905. Roots: Hoary alyssum has a long, slender, tap root. Stems and Leaves: Hoary alyssum has a basal rosette with oval or lance shaped leaves that are three to five cm long. The plant can have one or more flowering stems that are 20 to 70 cm tall and usually branch at the top. Leaves on the stem grow alternately, upward, and they are smooth edged like the basal rosette leaves. The stems and leaves are covered in tiny, star shaped, gray hairs giving the plant a gray appearance. Flowers and Seeds: The flowers bloom early spring to late fall depending on the amount of water they receive. The flowers are small, white, and have four petals. The petals are narrow towards the bottom and have a distinct notch in the top of them. There are two short outer stamens and four long inner stamens that are bright yellow. The seeds are contained within seedpods that are five to eight mm long. In each pod there are four to twelve dark, reddish brown, lens shaped, seeds that are one to two mm long. Methods of Reproduction: Hoary alyssum reproduces only through its seeds. The seeds can remain viable in the soil for up to nine years. Environments Favorable for Infestation: Hoary alyssum likes to infest dry, low nutrient, disturbed ground, like roadsides, trails, vacant lots, lake and stream beds, lawns, and even pastures. Environmental Impacts: Hoary alyssum is not palatable to livestock because of its woody stock therefor, decreasing forage in pastures and fields. In large amounts (30 to70%) it is toxic to horses and can cause swelling in the lower legs, fever, diarrhea, and in extreme cases death. Range: Hoary alyssum occurs in 38 of the lower 48 states and in Montana it infests 27 of our 56 counties as of 2015. Prevention: All equipment and vehicles must be carefully washed off after traveling through an area where hoary alyssum occurs to prevent spreading the weed seeds. Mechanical: Hand pulling, mowing, (mowers must be carefully cleaned after) and tilling repeatedly can be effective controls. Cultural: Goats and sheep have not been used to graze hoary alyssum although they will eat it. Chemical: Opensight, Chapparal, Payload, Broadstar, and 2 4-D have been useful in controlling hoary alyssum. Other: Prescribed burning, re-vegetation, and irrigation have shown successful results in controlling hoary alyssum. 1. "Biology, Ecology, and Management of Hoary Alyssum." NRCS. Web. 13 Aug. 2015. <http://www.nrcs.usda.gov/Internet/FSE_PLANTMATERIALS/publications/mtpmstn8346.pdf>. 2. "Biology, Ecology, and Management of Hoary Alyssum." Web. 13 Aug. 2015. <http://store.msuextension.org/publications/AgandNaturalResources/EB0194.pdf>. 3. "Hoary Alyssum." : University of Minnesota Extension. Web. 13 Aug. 2015. <http://www.extension.umn.edu/agriculture/horse/pasture/hoary-alyssum/>. 4. "Montana Weed Control Association." Montana Weed Control Association. Web. 13 Aug. 2015. 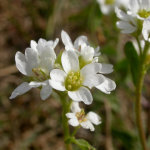 <http://mtweed.org/weeds/hoary-alyssum/>. 5. "Plant Fact Sheet." Web. 13 Aug. 2015. <http://plants.usda.gov/factsheet/pdf/fs_bein2.pdf>. 6. Web. 13 Aug. 2015. <http://www.pestid.msu.edu/wp-content/uploads/2014/07/HoaryAlyssum.pdf>.